The Scarlet Speedster and the Emerald Archer, together at last! It’s finally here. 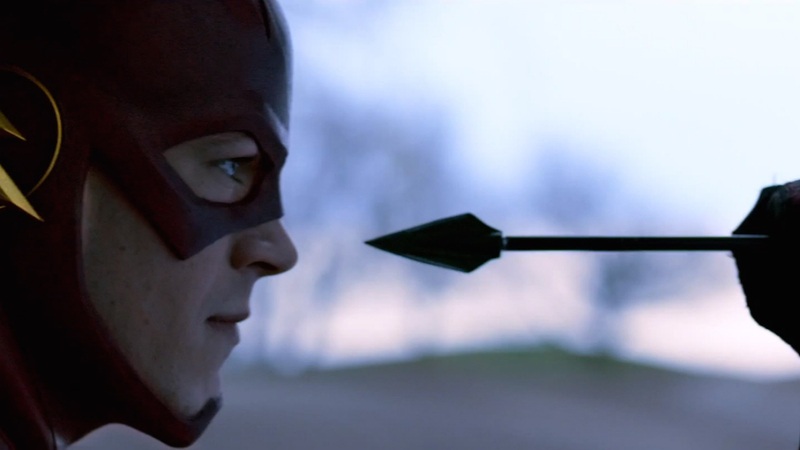 The much-hyped crossover between The Flash and Arrow starts with “Flash vs. Arrow.” While the two shows have technically already crossed over, with Barry Allen debuting on Arrow, Oliver Queen appearing in The Flash’s pilot and Felicity Smoak popping up in the show earlier this season, this is the first time we’ll see the two casts mix. And boy, this one was a whopper. With Team Arrow hot on the trail of Digger Harkness (aka Captain Boomerang), their search leads them to Central City, where they soon cross paths with Barry Allen. Barry’s investigating a criminal of his own — a metahuman by the name of Roy G. Bivolo who’s able to control people’s emotions. Naturally, the teams join forces, and Flash finds himself being trained by Oliver to fight smarter as Caitlin and Felicity search for Bivolo. Of course, things heat up when Bivolo uses his power on Flash, amping up his anger and sending him on a rampage that Arrow must stop. The episode has a ton of fun with the mash up, from Diggles’ priceless reaction to Flash (“Does that seriously not freak you out?”) to Oliver and Barry’s banter about their villains (“We can talk about giving your villains silly codenames later;” “What, over breakfast with Deathstroke and Huntress?”) Every character got their due (with the exception of Roy, who will appear in the Arrow segment), and seeing Team Arrow have a bit of fun for once was entertaining. That doesn’t mean “Flash vs. Arrow” was without drama, as the old superhero schtick of mind control meant Barry was in for some tense encounters. The scenes of Barry lashing out against his friends were great, as he actually managed to sidestep the usual “hero is evil” schlock and voice actual problems the character was having. With Flash gone rogue, the showdown between Oliver and a raging Barry proved to be the show’s greatest action sequence yet, with Arrow showing off the full range of his experience and Flash showing off some of his snazzy new powers (Dude can vibrate his molecules now!) When all was said and done, this part of the crossover did more than just bring Arrow to Central City, but smartly drove the plot forward as the effects of Barry’s rampage will be felt far beyond the next episode. “Flash vs. Arrow” delivered on almost all fronts, giving a huge amount of crossover fun, a fan-serving superhero battle and a great new development for Flash to deal with going forward. While Rainbow Raider was a fairly underwhelming villain, the excellent interplay between Barry and Oliver made up for it, with strong performances from Grant Gustin and Stephen Amell. Here’s hoping after Barry heads to Starling City, Captain Boomerang can come over to The Flash where he belongs. How was Flash and Arrow’s team-up? Was their battle awesome or what? Shoot off your comments in the area below.